Despite your best plans, nature always wins. We had planned a trip departing from our Airbnb in Bozeman, Montana to Grand Teton National Park, then spending the night camping at the border of Grand Teton and Yellowstone, and exploring Yellowstone the following day. Well, Mother Nature had other plans. A forest fire evacuated our campground and we had to quickly adapt our plans. Luckily this was pretty easy, and we did a quick drive through of Grand Teton on our way from Salt Lake City to Bozeman. First, I have to talk about Jackson Hole. What the actual heck. I was really excited to visit Jackson Hole, and we considered staying in an Airbnb there. To put it mildly, it was a disappointment. I’m not sure what I expected, but I couldn’t get over how flashy and obnoxious the main part of town was. I really think I’m more suited to dirty mountain towns like Moab rather than these sparkly mountain resorts (Breckenridge excluded, I love that place). So after a quick buzz through town I was ready to keep moving to get to Grand Teton National Park. Grand Teton seems to be weirdly overshadowed by Yellowstone, its neighbor to the north. But this park is really worth the trip south. Grand Teton National Park gives off more of a calm, quiet, yet still overwhelmingly impressive vibe than Yellowstone. Huge peaks like Grand Teton and serene glacial lakes like Jenny Lake are focal points of the park. There is so much to do and see in this park that you could easily spend many days or weeks here. We had about…half a day. Could we really see the park in a day? YES! And I’ll tell you how we did it below. After a quick stop at the park Visitors Center we headed up to see the famous Jenny Lake. From the Jenny Lake Overlook we were able to take in the beautiful lake and look across to the dramatic Cascade Canyon. Teewinot Mountain, Grand Teton, Symmetry Spire, Mount St. John, Rockchuck Peak and other mountains rose quickly and sharply from the flat lake in the foreground. All covered in haze from the nearby forest fires. Our next stop was along the Snake River at Oxbow Bend. This river is powerful, complicated and over 1000 miles long. Created by volcanic and glacial activity, the river looks calm and inviting but can actually be quite fast moving and dangerous. Since this was only a day trip through the park we weren’t able to join a rafting tour, but we’d like to float down this river someday. Even though you’d only be moving a few feet from the river bank I imagine you get an entirely different perspective on this area from the water. Our last stop was by far the most exciting of the day. 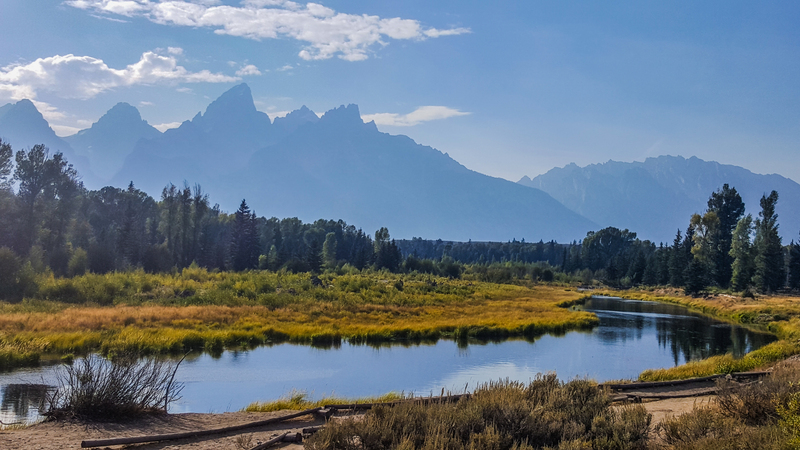 Schwabacher Road is a great place to visit for some mountain reflection pictures in the river. While yes, that was true and pretty, there was a much more exciting sight to see. A mama moose and two babies! As with all wild animals, you need to keep your distance. The same goes for moose, especially a mother with young moose. Between a mother and her calves is the most dangerous position you can be in and should always be avoided. Luckily there was plenty of room between us and this little moose family as they ate at the edge of the river. It was great to see other observers giving the moose plenty of space, too. There was so much moose excitement I really didn’t pay much attention to getting a good picture of the mountains reflecting in the river. Maybe next time. Despite our love of hiking, we weren’t able to do any in Grand Teton National Park. We were traveling with our two dogs who aren’t allowed on hiking trails in the park. However I would love to return to do some hiking in the future. After our half day auto adventure through the park we were off to our next stop, Bozeman, Montana! Have you visited Jackson Hole, Wyoming or Grand Teton National Park? What did you see and do there? Any other recommendations for a single or multi day visit? Tell me about it in the comments! Oh great! Glad you found it helpful. Grand Teton is a beautiful park, and easy to lump together with a trip to Yellowstone. Hope you have an exciting and safe trip!